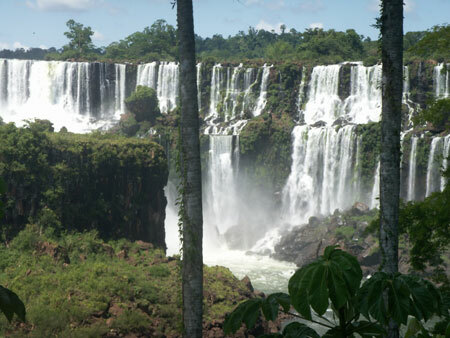 Editors Note: This article on Iguazu Falls National Park and the Falls kicks off our series on Iguazu, its tours, and its surroundings. Enormous, tropical green leaves, clear rushing water, mist sprinkling over your face and altogether one of the most picturesque nature scenes you will ever see in your life. This peaceful and beautiful place called Iguazu Falls is one of the most exquisite natural wonders of the world. Therefore, it must be on your list of places to see in South America. In addition, I felt so much more at peace in Iguazu National Park than I have during my entire stay in Argentina. The town, the people, the waterfalls, the nature and the vibe I received from everywhere and everyone were wonderful and refreshing. 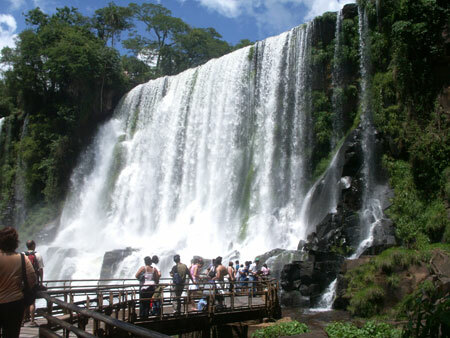 Even though Iguazu Fallss is a hot spot for tourists, it is still very easy to feel one with nature. To start off, it is important to talk about iguazu falls from the Brazilian side separately from the falls from the Argentine side. I can only describe the falls from the Argentine side, as that was the only side I was allowed to go to. Without a Brazilian Visa, U.S. citizens are not allowed to cross their border. However, while asking people whether or not we were allowed to enter Brazil, we did receive several offers to have random taxis drive us across the border. While some people take advantage of these offers, I was not in the mood to take the risk. If you do get caught, you will have to pay the $100 U.S. dollar fee for the Visa. 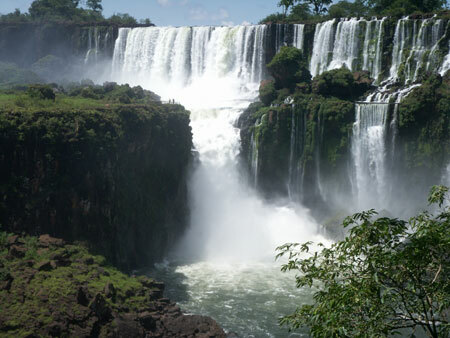 I do not know what else happens, so we decided to play it safe and stay on the Argentine side of Iguazu Falls. Fortunately, it was incredible and offers every angle imaginable of the falls. 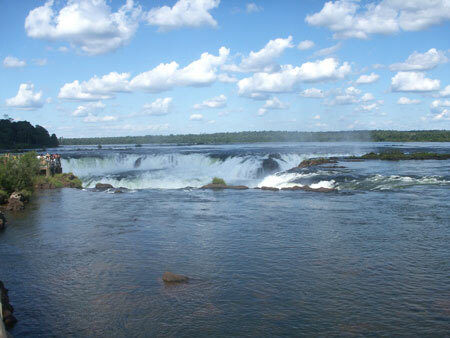 Another factor to consider is how much time you want to stay in Iguazu. While I would recommend taking your time and enjoying its beauty, you can pretty much cover all of the falls on Argentina’s side in one day if you want. However, this means getting an early start and maybe walking at a decent pace. We didn’t get there until 10, ate a pleasant and slow lunch at La Selva Buffet, and saw everything but one individual waterfall. However, I recommend taking your time and not rushing through to see everything. In addition, the park tickets are $30 pesos a person, but you can get your second day’s tickets for half price if you turn your ticket in at the end of your first day. This is a bargain well worth taking the time to exchange your tickets for. As for Iguazu National Park and the falls themselves, you are in for an unimaginable treat. The falls were much larger, more fantastic and more mind-blowing than I had expected. I knew the falls were gorgeous, but all descriptions heard and pictures seen do not do them justice. There is no way something so beautiful and enormous could be captured in a photo. It would be a sin to visit South America and not take a trip to the falls! I would also recommend that you try to see all of the falls. Each lookout point had a different view, and many more hidden pools or waterfalls came into view once seen from a different spot. The Circuito Inferior can be a little crowded, but I found the paths to be less crowded when stairs were involved…just a little hint for those of you who like to hike or walk at a good pace. However, do not walk so fast that you miss a Toucan flying over your head or a monkey in a tree! Iguazu Falls is all about the scenery and the experience of being surrounded by nature’s magnificent creations. I imagine it would be impossible to not find peace and relaxation at Iguazu. Do not commit the sin of leaving South America before seeing it! Hey, great blog! Very thorough. I am in Chile right now, but will be spending the next 2 months in Argentina. I will certainly be using this page for info! I’m working on a blog of all my travels in Latin America, and am wondering if you would like to exchange links? It’s still central America right now, but in a couple days it will begin to chronical my stay in Chile, and next Argentina. I really enjoyed reading your entry about your experiences at Izuagu. I can’t wait to go in two weeks! 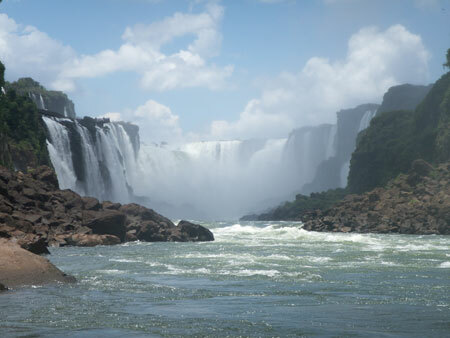 how do you go to iguazu falls from buenos aires? The easiest way to get from BA to Iguazu is to take the bus there. Iguazu falls is my favourite place from Argentina! OHHHH It’s so pretty. I love how the in some pictures there is a rainbow. great pictures from the falls. i was there in november `09 and found myself in a amidst impressive scenery. even i had to travel 20 hours by bus one way i would do it again at once. I agree completely!! I’ve just been to both sides of the falls & they are absolutely mindblowing! Take your time & absorb everything..the sights, sounds, smells & sensations. Amazing! Thanks for the reminder & the great photos. WOW that photo is like something your used to only seeing in dreams…. I just got back from Argentina, and Iguazu, and by far the best vacation I have ever enjoy, all the way around, been to Costa Rica- Puerto Rico, Mexico and Peru.